Once you have added your articles you can then think about structuring them on your portfolio. Each Page can have multiple Blocks, and one of the available blocks is the Article Block. 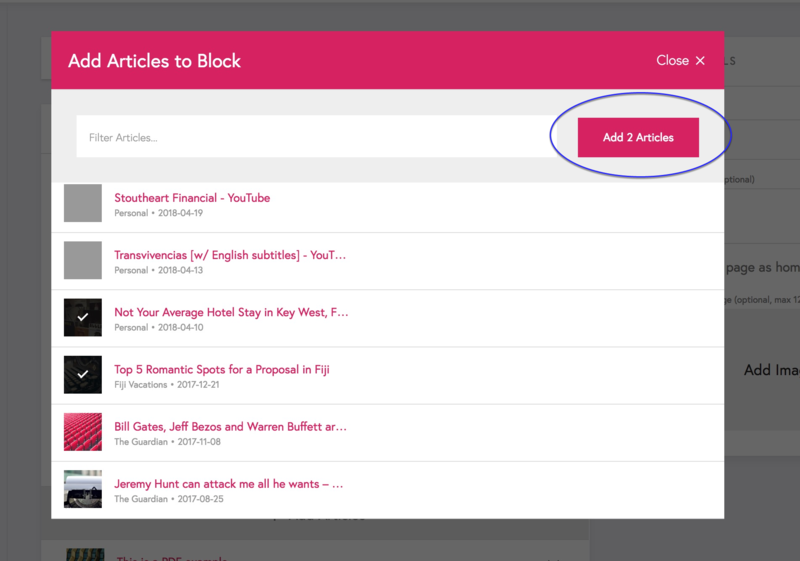 Articles are assigned to Article Blocks to allow you to display them in different places and in different sections. 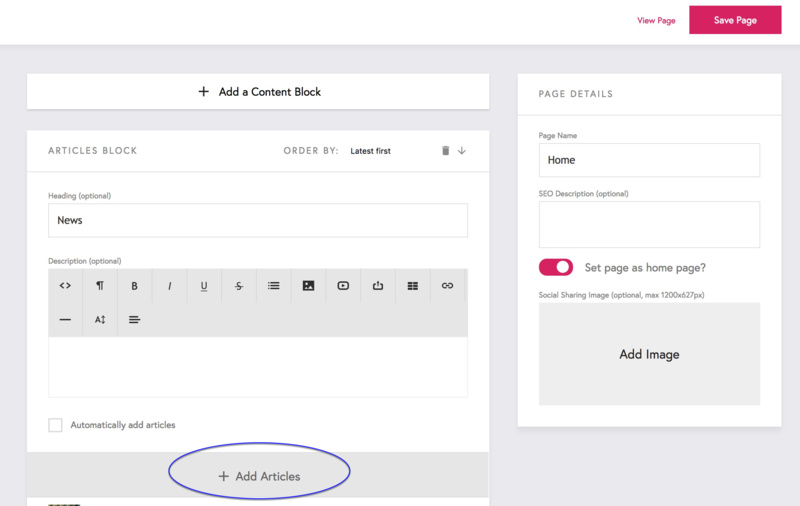 You should start by adding any Blocks you want, for example you might want one page with 2 article blocks or 5 pages each with one article blocks. Each page can have a different title but so can each block. To add blocks add/edit the page and then click 'Add Content Block' at the top. So you could have a Page for a certain publication, and on the page an Article Block for 'Travel', 'News' and 'Video' pieces for that publication. Alternatively you might have a page for 'Travel' pieces and on that page a block for each publication. There is no limit to how many articles a page can belong to. For example, it might belong to a block for 'Travel' pieces on one page and a block for 'The Guardian' pieces on another page. You will need to have added the blocks to the pages first. They will be named like 'Page Name - Block Name' if you have given the block a title, else they will be numbered. If you have a large number of articles, managing the manually can be slow. Instead you can use 'Tags' to manage them. Articles are automatically tagged with their publication name, but you can also add other tags, i.e. 'Travel' or anything you like. Then when you edit a page you can tick 'Automatically add articles' on the article block and choose some tags to automatically add. This can be an 'AND' or an 'OR', match articles that have ALL the tags you choose or ANY of them.